The first of my first earlies are just showing - this is very exciting! These must be the Red Duke of Yorks as the leaves are distinctly purple, and the other first earlies I planted, Foremost, are white. I got the first earlies in after St Patrick's Day (17th March) but before Good Friday (6th April) and the maincrop (Desiree) not long after Easter. You don't have to plant the earlies before the maincrop - the classification refers to how long they take to grow, not when to plant them - but I thought I might as well plant them in that order. Now I just need to find some patience while I wait until they're ready to dig up. Last autumn I managed to collect quite a lot of hazelnuts, or at least hazelnut shells. The trouble is, rather a lot of those shells turn out to be empty. Here's a little test, for demonstration. ... delivers only four nuts, and those are rather small. I won't give up on them, though. I'm encouraging hazel trees to grow in my garden (and they don't take much encouragement) and I'll gather as many as I can next year, too, because I love eating these nuts. It's just that at breakfast time, cracking twenty or thirty shells just so I can get enough nuts to chop onto my cereal is a teeny bit tedious. "As one gardener to another, it doesn't take that long to plant carrots"
My cousin said this to me when I explained that decorating the sitting room was some way down the list of priorities, behind things like planting carrots. Well yeeees... but it's a bit more complicated than that. Last year I tried companion planting to protect my carrots from the dreaded carrot fly - I interspersed rows of carrots with rows of onions - and it didn't work. The dreaded fly caused a lot of damage and it was a pain in the neck cutting it out every time I wanted carrots for dinner. This year I'm going to try a different approach. I've heard - and I can't remember where - that carrot flies fly along the ground, so one way of protecting carrots is to raise them up off the ground and put a wall round them, i.e. plant them in a not-full tub. Since then I have bought an angle grinder, so I really had no excuse for not cutting these in half. About a week ago I braced myself to tackle this task and persuaded Ian to help me. To start with his help consisting of watching and making comments like, It really would be a good idea to wear safety goggles, you know, (it's so annoying when he's right!) but after I'd done a little bit I found the whole thing too scary and gave him the angle grinder. He finished the job for me. I think his bright idea of attaching the second handle probably helped. Once Ian had done the scary bit, I took a file to the edges to smooth them off, then when they were safe to handle without fear of lacerations, took them out to the garden, filled with a mixture of soil and garden compost (that's the stuff you get if you heap up a load of weeds and leave them for a year or so), and sowed carrot seeds in them. I think that once thinned, there'll be about 65 carrots in each tub. After that, I got to thinking that maybe I could handle the cutting myself if it didn't involve power tools. Chatting to a neighbour about this, I asked if he had any suitable metal cutting tools that I could borrow. He did indeed have a pair of tin snips that he was happy to lend me, but suggested scoring the metal with the angle grinder first. This turned out to be excellent advice. I tried the snips on their own first, but wasn't strong enough to cut through the metal without injuring myself in the process. On the other hand, using the angle grinder to score the metal wasn't too scary; it seems the alarming kickback occurred when the disk broke right through. It was quite a long job, but I managed to turn one drum into two tubs all by myself. In the process I discovered that this drum hadn't been entirely empty. It originally came from an organic honey factory and apparently had a fair bit of honey left in it. I'm not sure how clean it was when I got it, but it certainly wasn't fit to eat by the time I'd cut the barrel and spilled it all over the conservatory floor. Oh, well. I decided to have a break and clear it up later. Some time later I went back out to the conservatory and was puzzled by a noise. I couldn't put my finger on it at first... it was quite loud... buzzing... like a large number of bees. Ah - best not to leave honey all over the floor when your neighbour's a beekeeper. The conservatory was indeed full of bees, many of whom were happily tucking into the honey. Hmm, not a good time to file down the edges of the tub. Nor indeed to walk through the conservatory. I went round to the neighbours (not the beekeeping neighbours), who were coming over for dinner later, to let them know that they might prefer to come round the house and use the other door. From outside, I could see that bees' legendary navigational skills were somewhat overrated. And there it stayed for several days. Eventually it rained (yes really, we had several days without rain) and all the bees went away, apart from the ones that drowned. Catching a gap in the rain, I swished out the tubs with the rainwater that had collected, scooped out the remaining honey with a stone, and brought both tubs indoors to finish the job. There was quite a lot of finishing to do. Once filed down, I took the tubs out to join the other two, filled with soil and compost, and sowed more carrots. Pebble kept an eye on things. Actually, it does take that long to plant carrots. You may think it's a bit late in the year to be looking back over how the garden fared last year and thinking about what I'll be doing next year, and indeed it is, but the short version of my review/plan goes something like this: Yep, same again next year but more and better, so I didn't need to look at the details before getting started on this year's growing. On the other hand, having got quite anxious about the productivity of the garden, the least I can do is review it properly. Garlic: Fell over. Didn't weigh it, but there was some. Leeks: 4 lb 1 oz. Ran out far too soon - need more! Red cabbage: 3 lb 10 oz. Of the six I planted out, only three formed heads and two of those were rather small. Twice as many next year. Turnips: Mostly slug eaten and very small. Didn't bother harvesting. Only grew them because I had free seeds. Broad beans: 1 lb 8 oz. Lots of empty pods. I think it was just a bad year for broad beans. Peas: 7 lb 15 oz. A great success, but ran out of frozen peas in mid Jan. Need more! Runner beans: 5 lb 11 oz. Pretty much spot on. Weren't as good frozen, so not worth growing more than that. Squash: Failed miserably in greenhouse. Pumpkins and courgettes made it to the garden before getting eaten by slugs, so I'll try again next year with better slug protection. Sunflowers: Smaller than expected. Didn't need that much space. Didn't get round to harvesting. Will try again, planting closer. Tomatoes: 4 lb 5 oz: Disappointing. Move some to greenhouse, be more vigilant on the side shoots, and hope for better weather. Aubergine: Failed miserably in greenhouse. Won't bother again. Carrots: 6 lb 8 oz. What a pain these were! Will try alternative methods of deterring carrot fly. Celery: 1 lb 5 oz. Very thin stalks, but still worth having. Surprisingly resilient in frost. Try feeding better next year. Fennel: All slug eaten. Try again, with better slug protection. Parsnips: 1 lb 14 oz. Nowhere near enough. Grow more of them! I have to say, this has been pretty successful. Even the carrots and tomatoes, which were very disappointing, managed to produce several pounds each. Furthermore, I've more-or-less had veg available in the garden continuously since I started harvesting new potatoes in early June. There hasn't been a great abundance, but something available to harvest once or twice a week (much more in late summer), every week. This does depend on counting the wild veg (ground elder etc.) in early spring, but increasing the quantity of leeks and parsnips will help there. Similarly the quantity of broccoli has been disappointing, but the quality is outstanding - it's the best broccoli I've ever tasted! If I can grow more of these winter veg then hopefully I'll have a continuous supply, eventually supplemented by asparagus in May, right through the year. That would make me very happy. I then tried applying this to the garden and realised that crop rotation requires each group to take up roughly the same amount of space. I'm growing a lot of peas and beans, so I just about managed to squeeze the potatoes into the space they occupied last year (though I don't think I'll persuade them to grow up the fence behind the asparagus), but onions and carrots take up far less space, so I needed to find somewhere else for peas and beans this year. Brassicas, although space-hungry, aren't grown in large numbers, at least not in this garden. Last year, to further confuse, I put red cabbages, pumpkin and courgettes in the flower beds. I don't think I want onions and carrots there. This is all getting rather complicated. This means a three year rotation, which isn't great, but it's better than not moving things around at all. Another way of working this out would be to look at what proportion of the garden is taken up by the largest crop. If the spuds take up a third of the available space, that'll be a three year rotation before you've grown spuds in every part of the garden. Of course, I might yet confuse myself further by bringing other parts of the garden into veg-growing use, but not this year. ... seems to be getting fashionable. This presents me with a dilemma; I despise fashion but love learning about new things I can eat. The latter won out when a neighbour gave me a little leaflet she received with her seed order, all about edible flowers. It seems to me that most edible flowers are a bit of a disappointment. The petals are flimsy and pretty tasteless, being merely advertisements for the little drop of nectar in the middle. Dandelions are a lot more substantial than most, being nearly all middle , and nasturtiums have a peppery flavour throughout the petals. I've now discovered a new addition to my short list of flowers worth eating: Tulips. My tulips have taken a bit of a battering in the recent weather. That one at the front is lunch. Tulip petals are far more substantial than most - they have to be to stand up like that - and they have a savoury taste reminiscent of peas and beans. Even better, they can be harvested towards the end of the flower's life without much sign of deterioration, so you can enjoy the flower and then when it's over, eat it. Not only are they tasty, but they look so pretty! Rub a little butter into some flour, chuck in some sugar and bicarb (probably not quite that much of either, but never mind), and a few drops of vanilla, add the leftover rhubarb crumble and mix thoroughly. Put teaspoonfuls on a baking sheet and squash them a bit. Cook until they smell done. I thought these would make biscuits, but they came out more like cakes. Quite nice, though. Breadcrumbs last for ages if they're dry. I keep them in a paper bag in the cupboard. I usually turn the last slice of the old loaf into breadcrumbs, using the grater instead of the electric blender. This takes ages. Some might consider this to be taking my anti-electricity drive a bit far. The remaining cold chicken is in a box in the fridge and the bones are on the compost heap, where they will be picked over by magpies until I bury them with more weeds. I strained the dandelion wine into bottles, which involved lots of sterilising of things. I'm experimenting with an alternative to air locks here (not having any balloons) - I've just left the caps slightly unscrewed. Nothing's going to fall in, and it doesn't seem very likely that anything would find its way up through the gaps, especially against the flow of carbon dioxide coming out. I might tighten the caps when the fermentation slows down and just release the pressure from time to time (these being bottles that can withstand quite a lot of pressure). These are now fizzing away merrily on the kitchen counter. I also did lots of washing up, so my kitchen looks halfway respectable again now. Tidy kitchen. No, I'm not showing you the state of the floor. St George's Day is the traditional day for gathering dandelions to make wine and as the sun was out this morning, that is exactly what I did. I did have a look at a recipe this year, as the 'Ish forum's resident wine expert recommended the second recipe on this page, but then largely ignored it. I drank the last bottle of last year's attempt yesterday and decided that it's really rather nice, as a light, refreshing drink. The recipe calls for two quarts - that's four pints - of dandelions to one gallon of water. I'm making a bucketful, which is two gallons, and last year I used all the flowers within easy reach on the north side of the house. This year I upped that a bit to all the dandelion flowers on my patch, north, south, east and even a couple to the west, growing up by the conservatory roof, plus a few from my neighbour's garden. That came to two and a half pints. I also had a few dried flowers left from last year, so I chucked those in as well. I added two (very) small lemons, after relieving them of their pips, plus a bit more lemon juice. Sugar quantity was a one kilo bag plus what was left in another bag - probably about three pounds in total. I chucked everything in the bucket, covered with a kettleful of boiling water, then filled up with cold and sprinkled yeast on the top. That was lunchtime and it's not doing anything yet, but I'm sure there'll be bubbles some time tomorrow. I don't know how long I left it in the bucket last year, but I might actually pay attention to the recipe and give it no more than two days before straining into demijohns old pop bottles. After that it's a matter of patience, racking into bottles, more patience, ideally another racking, and yet more patience before drinking it. Late last summer, I made bilberry and blackberry jam. It's OK, but not that great. It didn't set very well and the flavour's not particularly strong. I find my heart sinking at the prospect of working my way through the umpteen jars of it still in the cupboard. This is not good. I need another use for it. I added a couple tablespoonfuls to my usual cupcake recipe, reducing the sugar content slightly to compensate (6 oz flour, 3 oz each of butter and sugar, reduced to 2 oz sugar, 2 eggs, bicarb/cream of tartar*, skip the vanilla essence). The result was excellent! Soft, moist sponge cake, distinct but not overwhelming fruit flavour. Note: If you try this recipe, make sure you put enough cream of tartar in. I reduced the quantity the second time, thinking there'd be enough acid in the fruit to make the bicarb fizz (there was) and it changed the colour of the cakes from pink (cooked to brown on top, looking deceptively like chocolate cake) to dark blue. Not so appetising. Still tasty, though. My second experiment was not so much about using up preserved fruit as making a special treat. I made damson fruit leather (amongst others) at around the same time as I was making jams. These have kept very well in not-very airtight tins - some have got a bit sticky, but all are still tasty and no sign of mould. A while ago I tried the damson one with a little mascarpone cheese. The result was heaven! I decided to save the rest to serve like this as party food. So it was that on Saturday evening, I was cutting damson fruit leather into little squares and making little cheese sandwiches, with a good dollop of mascarpone between each pair of squares. And then I forgot to get them out of the fridge with the rest at Sunday lunchtime. I remembered them in the evening, and got them out, by which time the fruit leather had drawn nearly all the moisture out of the cheese, making the cheese firm instead of creamy and the leather squidgy instead of firm. The net result was very disappointing. Top tip: Don't bother making these in advance for guests, make them and eat them immediately, all for yourself. To rescue the situation, I whizzed the sandwiches up with milk and sugar (that sounds like I just stuck it all in the blender and pushed the button. I did, but there was also a lot of poking it with a wooden spoon handle), whisked a couple of egg whites I had left over, and I now have damson and mascarpone ice cream setting in the freezer. * I ran out of baking powder a while back and used a mixture of bicarbonate of soda and cream of tartar instead, and the result was much better. No more baking powder for me! The spell of hot weather has broken and before we were plunged back into the depths of winter, whilst I was still feeling glad of a drop of rain again, I took this photo. Last year's red cabbage is now bolting* and putting up flower stalks. The flower buds of this one caught a raindrop that glistened like a jewel in the morning light. Of course, yesterday's snow and gales knocked that plant flat. * That is, the cabbages that didn't form heads are bolting, plus one that did, was cut and put out several new shoots around the cut stalk. This is the one I want to collect seeds from - what a cabbage! It turns out that my advance meal planning was not advanced enough. Some of these are big enough to eat, but there's definitely not enough there to provide salad for fourteen people, or even for the ten who are likely to want it. Now, can I forage enough wild leaves to make a decent salad, and would my guests be happy to eat it? A request by one of the followers of this blog has drawn me, the not-so-suffering husband into putting some words together. First off, I'm amazed and very proud of the following this blog has garnered over the past months. You think it's good to read about, you should try being here being a part of the experimentation and getting to eat the produce that so much hard work yields from the garden (even though I must confess to being a long way from being a vegetable lover!). For the most part, I leave Rachel to it, helping out only where a bit of muscle or advice is required. She really does work very hard to make it all happen – you don't need to bother with gym membership if you have this sort of lifestyle! So, do I just sit back and enjoy having my own self-sufficient slave? Not really, no. As much as I love curbing our impact on the planet – and I really do like that – I'm a petrolhead who likes meat. Both are rather expensive elements of my life and so I have to work to fund these aspects. I spend my time writing, and am lucky enough to get paid for that. So, having got that out of the way and set the scene, I can now continue to write about a fossil-fuel guzzling monster on a blog about self-sufficiency! I've owned 2CVs since I was a long haired 18 year old and have owned Elly since 2000. We've been through an awful lot together and are looking forward to our 100,000th mile together later this year. She's a constant work in progress, having undergone lots of restoration work over the years. I'd much rather do this that throw her away and buy something newer though. Why do people buy new cars when there are so many good second-hand ones out there already? Buying a second-hand car is pure recycling, especially if you keep repairing it rather than throwing it away when something breaks. No, I'm not showing you a picture of our first kiss! 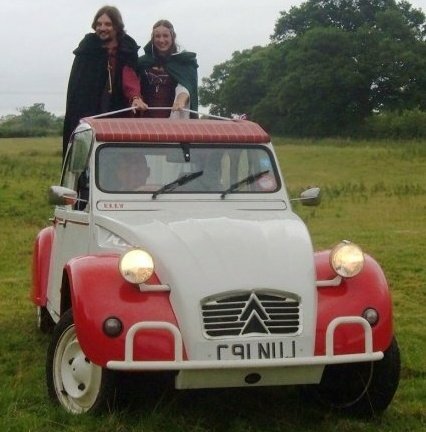 Rachel herself has been won over by the 2CV's simplicity, though she prefers her Austin Mini to get about in – simplicity on wheels! Our motto is, why buy a complicated car when a simple one does the trick just fine? Less to go wrong, less to worry about. I own other cars too, but they come and go (though they are always cheap and simple!). 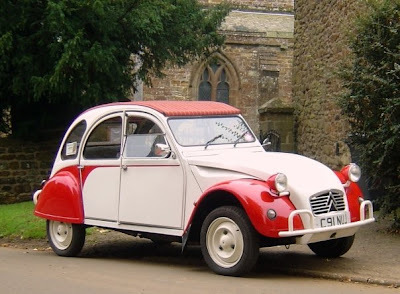 The 2CV remains. After all, it isn't just a car, it's a way of life. Wild pansies in the rhubarb bed, with aubretia tumbling down the wall behind. OK, they're not really purple, but humour me, would you? and what's that in the background? Yes! It's purple sprouting brocolli! The best purple flowers of all! I'm a bit late posting this (twice late - I started writing it yesterday) - the exploring actually took place three weeks ago, but I was reminded of it today yesterday, for reasons that will become clear. It was the day I needed to soak half a basket in the stream. While I was over that side of the railway line, I had a little explore. The old mill still has its waterwheel, though I don't think it's turned for some time now. The old woolen mill. Not made of wool. Pebble came with me. I don't think she'd been brave enough to go down here on her own. She had a good look round the mill. Some holes in the wall were smaller than others. And others were just the right size for a cat. Outside again... what's this? Could this be the wild garlic I failed to find last year? This is not wild garlic. This is lords and ladies. Don't eat it. ... especially when the leaves are bigger. But here's the clue: Wild garlic smells of... garlic! Similar appearance, very different smell and taste. Use your noddle and you won't poison yourself. ... when dandelion fritters are on the menu again.